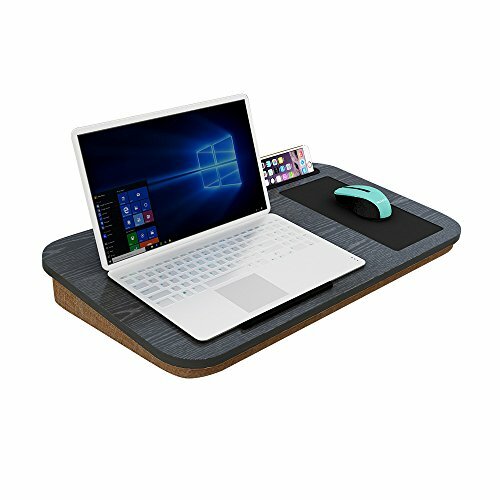 HOME BI Lap Desk--makes use laptop so much easier and comfortably! If you are a gamer, using the Lap Desk for gaming while leaning on the couch will give you a new experience. If you are a mouse user, then you wouldn't have to try to balance the mouse on the edge of the sofa while sitting on sofa and using the laptop. If you are an artist, this Lap Desk will come in handy when you want to sit in random places and sketch. Get your work done from your couch with the HOME BI Lap Desk, with a surface wide enough to fit up 17-inch laptop and accommodate its built-in mouse pad. Large Surface - Measured at 22"Lx12"Wx2.75"H. Smooth, flat surface. Large work place for laptop table. Built-in Mouse Pad - It is essential for those who prefer to use a mouse. Media Slot - Holds your cell phone and tablet,so your devices are always accessible and stay organized. Heat Dissipation - keeps the laptop off the legs and keeps the legs from getting super hot from it. If you have any questions about this product by HOME BI, contact us by completing and submitting the form below. If you are looking for a specif part number, please include it with your message.